1. Combine onion, garlic, Worcestershire sauce, hot sauce and seasonings in food processor. 2. Pulse until onion is pulverized. Add olive oil and process for a few seconds. 3. Pour into a bowl and whisk in Southern Comfort. Set aside. 4. 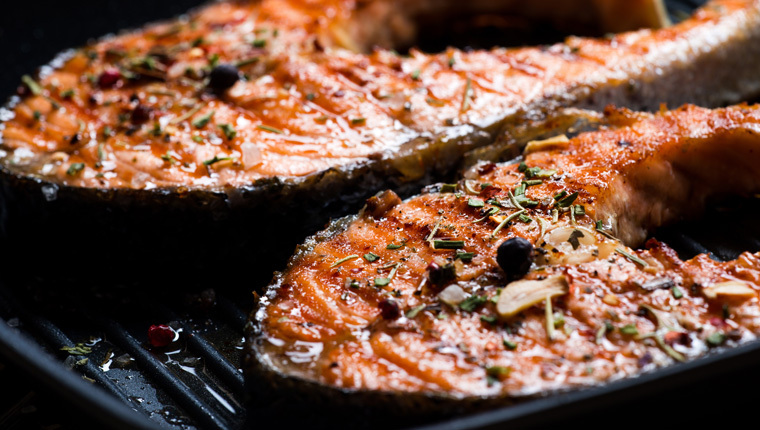 Place salmon steaks in a shallow dish and pour marinade over fish to coat. 5. Cover with plastic wrap and refrigerate 3 to 4 hours, turning salmon steaks once. 6. Remove fish from marinade. Reserve marinade. 7. Grill salmon steaks for 6 to 8 minutes. 8. Carefully turn and baste with marinade then cook another 6 to 10 minutes, or until fish flakes. Makes 6 to 8 salmon steaks.